Other predictive markers include CCL18 for progression of ILD and KL-6 for acuteness of lung fibrosis. Lung‐epithelial‐derived surfactant protein (SP-D) has been identified as a biomarker of systemic sclerosis-interstitial lung disease (SSc-ILD), according to a study published in Arthritis & Rheumatology. Other predictive markers include chemokine (C-C motif) ligand 18 (CCL18) for progression of ILD and Krebs von den Lungen-6 (KL-6) for acuteness of lung fibrosis. The 2 study cohorts included a total of 427 individuals with SSc. 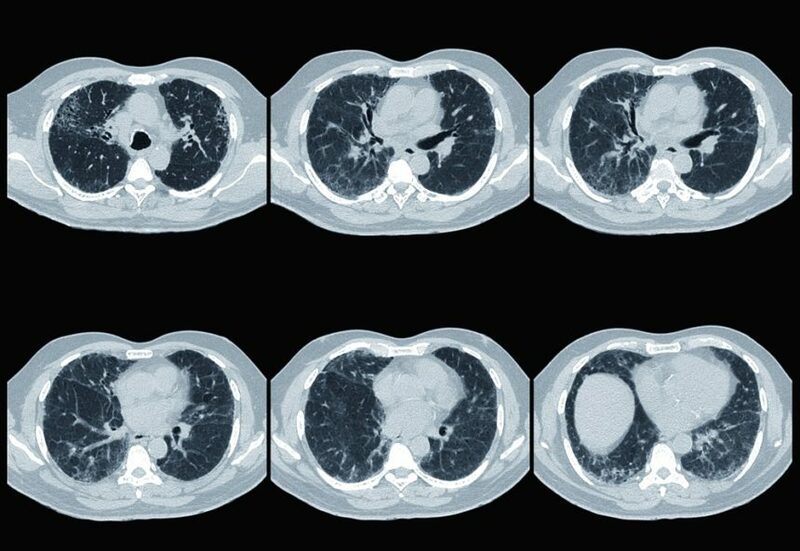 Pulmonary function tests and high-resolution computed tomography (HRCT) were used to examine lung fibrosis. Participants’ blood samples were examined for concentrations of KL-6, CCL18, OX40L, and SP-D. Follow-up lasted a mean of 3.2±4.4 years, during which time correlations with baseline and prognostic power for disease progression were studied. Each biomarker’s diagnostic ability was investigated using analysis by receiver operating characteristic (ROC) curve, and Spearman’s test was used to investigate associations between biomarkers and quantitative values. Either fibrosis content >20% or forced vital capacity l<70% and 10% to 30% extent of fibrosis constituted extensive lung disease. KL-6 showed baseline associations with diffusing capacity of lung for carbon monoxide (r=–0.335; P <.001), fibrosis extent (r=0.551; P <.001), and forced vital capacity (r=–0.317; P <.001). Lung fibrosis was identifiable through serum levels of SP-D, KL-6, and CCL18, though multivariate analysis showed strong associations between lung fibrosis and KL-6 (odds ratio [OR], 2.41; 95% CI, 1.43-4.07; P =.001) and SP-D (OR, 3.15; 95% CI, 1.81-5.48; P <.001). KL-6 proved to be the most consistent biomarker. In individuals with baseline interstitial lung disease, CCL18 proved to independently predict both new disease development (hazard ratio [HR], 3.71; 95% CI, 1.02-13.52; P =.048) and a decrease in forced vital capacity by >10% (HR, 2.90; 95% CI, 1.25-6.73; P =.014). Participants could be stratified into 3 risk categories based on these findings: mild risk, 30% to 44%; moderate risk, 45% to 70%, and high risk, ≥70%. Study limitations included the relatively short duration of disease, low disease progression rates, and a lack of comparison between the study’s biomarkers and other diseases that present with lung fibrosis. Disclosures: This study received funding from Institut Roche and Association des Sclérodermiques de France.